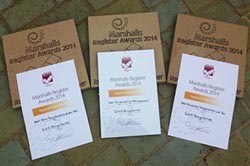 The Marshalls Awards were launched in 2008 for companies that are accepted onto the Marshalls Register of Approved Landscape Contractors and Driveway Installers. 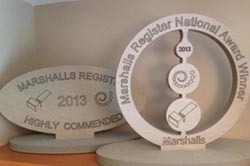 To qualify as a Marshalls Register member, companies must undergo a rigorous assessment and fulfil a range of criteria to be able to join the list of approved installers. Our skills & capabilities are reviewed periodically by Marshalls to ensure that our skills and staff training in any specialisms are current. This ensures an ongoing high level of workmanship and quality. These awards are on a National and Regional basis and are the most prestigious awards within the industry. Over the past few years, GWH Paving has been honoured with various awards, from the Marshalls Register both at Regional and National level. Click on the links below to view awards won by GWH since 2008.